It's time to read the classic novel of American Boyhood again. 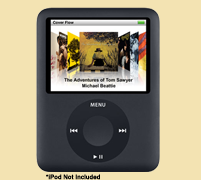 Better yet, listen to it in this new audiobook version by veteran voice actor Michael Beattie! 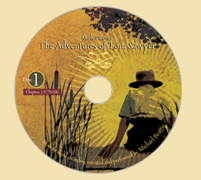 In this new recording -available for the first time as a download (easily transfered to your iPod or iTunes) or as an attractive 6 CD set, The Adventures of Tom Sawyer comes to life as never before. A veteran of multiple cartoon series', Mr. Beattie provides original voice characterizations for the 36 different characters in the novel. From the cantankerously comical (Aunt Polly), incorrigible and ultimately heroic (Tom); to sympathetic (Huck Finn), all the way to the pitiable (Muff Potter) and downright evil (Injun Joe) -all your favorite characters are here and brought to life in a fresh new recording. 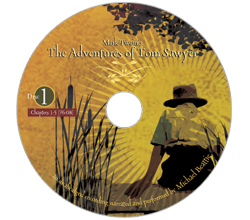 Even the Narrator is a character - Mark Twain's bemused and insightful perspective on life comes shining through. 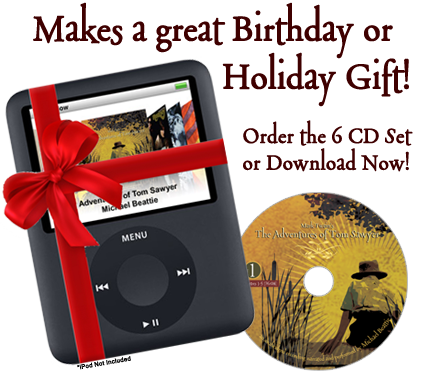 For your convenience, you can order the audiobook as a 6 CD set -or start listening immediately by clicking on the Download Now button.